Dalton, Elias, and Wandersman have answered the challenge of transforming an abstract, theoretical topic into a lively and understandable subject for students. Through concrete examples and consistent pedagogy, this text helps students understand the concepts and provides opportunities for students to apply the concepts. 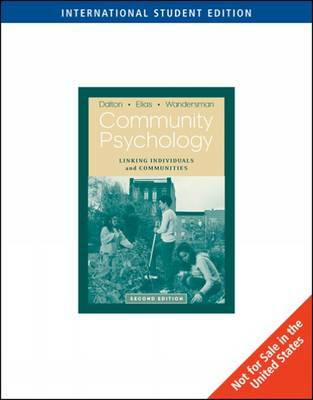 After introducing community psychology and its history, the authors describe methods of community research and discuss how to understand communities from the perspectives of sense of community, coping, and social support. The focus then shifts to community programs and actions: preventing problem behavior and promoting social competence, citizen participation, organizing for community and social change, and program evaluation and development.